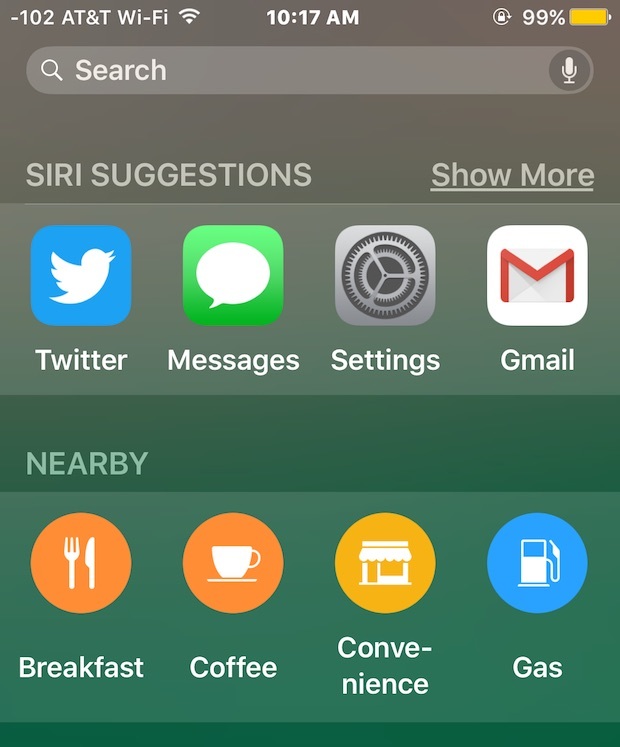 Siri Suggestions is a feature of modern versions of iOS that recommends contacts, apps, nearby locations, and news, right from the Spotlight search screen. Siri Suggestions aims to be intelligent and learn from user behavior on the iPhone and iPad, offering contacts and apps depending on usage patterns, location, and the time of day, and while this feature is appreciated by many iOS users, some don’t use it, and others may find it unnecessary, slow, or unhelpful. If you’d like, you can turn off Siri Suggestions in the Spotlight search screen of iOS easily. 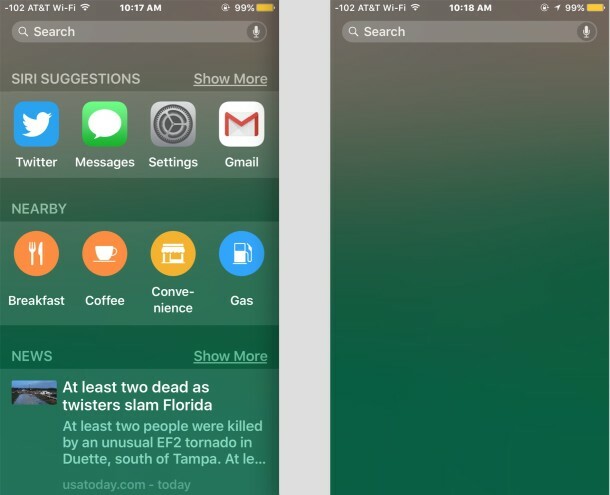 Doing so still allows you to use Spotlight just as before in prior versions of iOS, including searching the local device, the web, and Wikipedia, it simply removes the suggested section from offering results before searching in Spotlight. 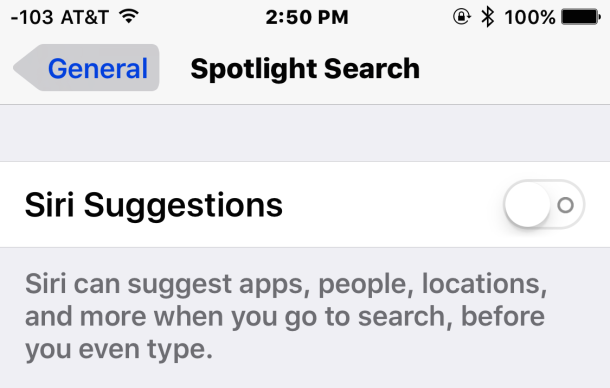 Returning to Spotlight in iOS will no longer have the contacts, apps, nearby locations, and news data within the search page. If you use this feature often you likely won’t want to do this, but there is a potential advantage for disabling Siri Suggestions on some older devices in that it speeds up iOS 9 on some of those devices with less powerful hardware, whereas the latest iPhone and iPads likely won’t notice any difference in performance. Of course, you can also enable or re-enable Siri Suggestions by simply returning to the same settings screen and flipping the switch to the ON position. Siri Suggestions is available in iOS 9 and later versions, so if you’re running a prior version of iOS you won’t see the feature at all, and thus won’t have a toggle to enable or disable the service. I do not like this ‘feature’, I don’t use it and it slows down my iPhone. Turning it off makes a noticeable improvement in speed on iPhone 6. Funny thing is, if you ask Siri, “Who do you suggest I call?”, she has no idea about these suggestions. So they are not true Siri suggestions. Odd that with Apple’s attention to detail, they missed this. I like Siri Suggestions in general (though I agree that it is misnamed), but I’d like to remove the News part, which shows me stuff I don’t care about. Any way to do that? Go to spotlight search settings and disable news and web results. That did it for me. I followed the instructions above, but that screen just will Not go away. Is here something else I can try? I did the exact same thing as Ronald. And the stupid Siri suggestions is still there! Me too. I’ve followed the rules but it won’t go away. Same thing as others! I followed directions to the letter and they still show up! So frustrating. Ok. So I found st the bottom of that screen is an edit button that allows you to decide what you want to show. I did “turn off” Siri app suggestions. Not sure if it is really “gone ” but at least it doesn’t show. I don’t have a damn iPhone!, I have an Android,areally,reallyreally good one!! How do I get rid of the useless news headlines screen from my display???! This didn’t work for me, but I finally found a way to get rid of it on my phone. I just scrolled all the way down to the bottom of the page and clicked on the edit button. After that, it will bring you to a add/remove widget page and you should be able to remove it there.